The snow is melting here in Chicago today, and so the Kindergarten's recent science experiment on figuring out what happens to a snowman when the temperature changes is quite timely. The children learned about solids, liquids and gases. 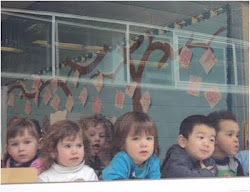 Before they began, they wrote down their predictions (hypotheses); while pretty much everyone expected the snowman would melt if it was inside the classroom, some expected that to take 24 hours, while others believed it would take just a couple of hours. The class began the experiment with three frozen snow balls that were connected with salt to create a snowman. Of course the children dressed him up and gave him a name: Green Frosty Snowy. Every two hours the class measured the liquid as it melted off the snowman. The kids noticed that the snowman became smaller and smaller. This turned out to be a two-day experiment because it took the snowman 12 whole hours to melt! Once Green Frosty Snowy had melted, the water was poured into a skillet and the children watched as it transformed into steam, i.e. gas. It took 1 hour and 12 minutes for the liquid water to be gone. 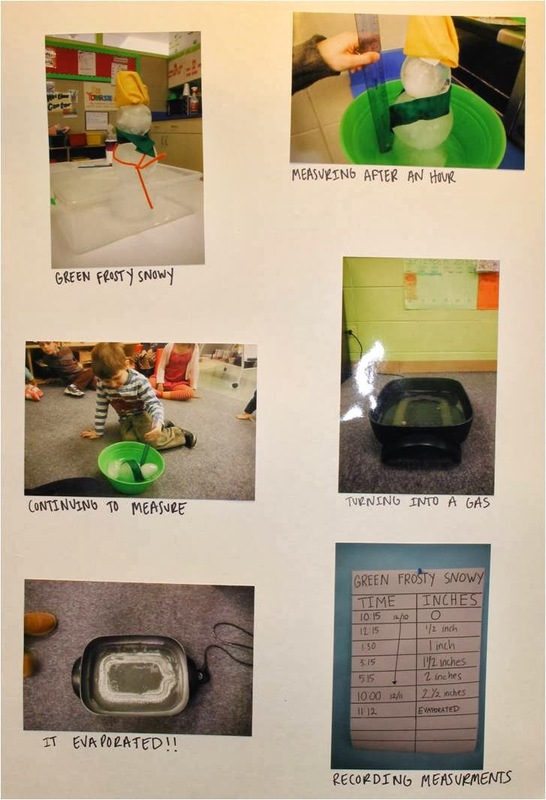 Throughout the experiment, each child kept an experiment book to record his/her hypothesis and observations on what Green Frosty Snowy looked like as a solid, liquid and gas, and what she/he learned from this experiment. Surely, these kids will be well prepared when it comes to running Science Fair experiments in 3rd/4th grade!